The Craftsman Three-Tier Welding Cart is designed to hold portable MIG and flux core wire welders, plasma cutters and TIG Welders. This cart features a three level design to help organize all your welding tools and accessories. It also has a set of cable wraps on each side for easy and safe storage of your welding cables. This unit also has an on-board cylinder rack to secure gas cylinders up to 7 inches in diameter. 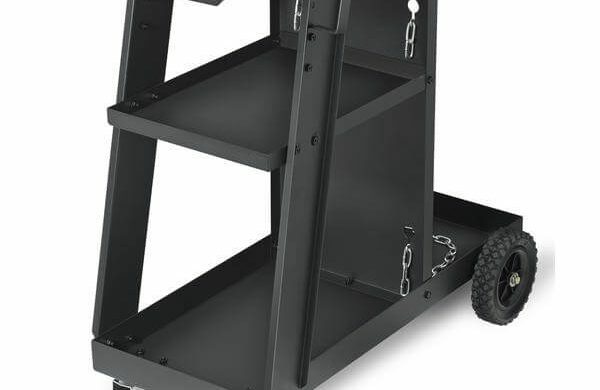 The 6 inch solid rubber back wheels and the 2-1/2 inch solid rubber casters help maneuver this cart. Your welder or cutter sits on the top shelf, slanted to help get a better view of the unit controls.